The Business Trust Long Run was the world’s largest corporate relay. It was designed to profile the Business Trust partnership. Relay teamseams from the businesses involved in the Business Trust and government departments joined communities and celebrities to complete run across South Africa. Each run saw a different route, and from 2002 over 9000km have been covered by nearly 5000 runners. Routes included Kalaghadi to the Kruger, Cathedral Peak to Table Mountain, and Hoedspruit to Kwa-Mashu outside Durban. The final route was a celebration of Nelson Mandela’s 90th birthday, starting near his birthplace in Qunu and finishing outside his old house on Vilakhazi Street in Soweto. Participants visited projects that benefited from the Business Trust. The Long Run was a celebration of South Africa and the people who make it great. It showed that we can make a difference by working together. 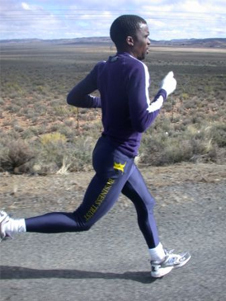 During the first Long Run from Cape Town to Johannesburg in 2002 a Guinness World Record was set by a team of 10 professional runners, running under the Business Trust colours. They set a new world record for running 1000 miles (1609.3km) in 99 hours 3 minutes and 27 seconds, climbing 1700m in extreme weather conditions. 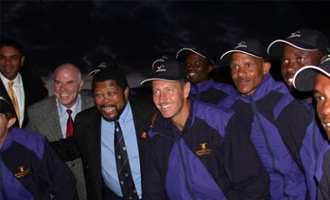 Starting on Wednesday, 14 August 2002, the team arrived in Johannesburg on Sunday, 18 August 2002 to coincide with the World Summit on Sustainable Development. The world record was entered into the Guinness Book of World Records in 2003. In order to set the record, each runner had to achieve 3 minutes 23 seconds per kilometer, day and night for 91 hours 20 minutes. Unbelievably, each runner ran the equivalent of a 2 hour 23 minutes marathon each day. They repeated this feat for 4 consecutive days over hilly terrain, facing a start to finish altitude change of over 1 700m. Minister Balfour said at the opening of the run: "Just thinking about ten athletes collectively covering 1000 miles is breathtaking enough. He went on to say "While this is a serious attempt at breaking the current World Relay Record, it is also an innovation to promote our country as a major role player in global business. The partnership between business and government as represented by the Business Trust is an important initiative in promoting South African business both at home and abroad." 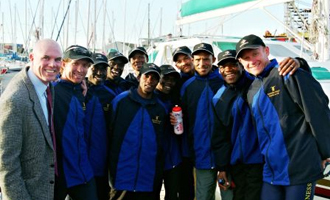 Ngconde Balfour, then Minister of Sports (now Minister of Correctional Services) sets the team off in Cape Town on Aug 18th 2002. (Participated on the 2006, 2007 and 2008 Business Trust Long Run). ABSA Group Limited, African Rainbow Minerals, Adcorp Holdings, Holcim, Anglo American Platinum Corporation Limited, Anglo American PLC, Anglo Coal, Anglogold Ashanti Limited, Anglovaal Mining now African Rainbow Minerals, Avis Fleet Services, B & W Instrumentation & Electrical (Pty) Ltd, Barloworld Automotive, Barloworld Corporate Office, Barloworld Equipment, Barloworld Limited, Barloworld Logistics, Bauer & Thomson, Bearing Man Limited, BHP Billiton Group, Brimstone Investment Corporation Ltd, Business Against Crime, Cape Town Tourism, City Lodge Hotels Ltd, CNBC, Consol (Pty) Limited, DaimlerChrysler South Africa, De Beers Consolidated Mines Limited, Deloitte, General Motors, Department of Education, Department of Environmental Affairs & Tourism, Department of Housing, Department of Labour, Department of Provincial & Local Government, Department of Public Works - EPWP Working for Water, Department of Public Works, EPWP Working on Fire, Department of Public Works, Department of Transport – KZN, Dimension Data, Discovery, ECI Africa, Ernst & Young, Eskom, First National Bank, FirstRand Ltd, Fourway Haulage SA (Pty) Ltd, French Engineering Works (Pty) Ltd, Futurekids, G J Schouten & Sons (Pty) Ltd, GoldFields Ltd, Grant Thornton, HA Falchem, Harmony Gold Mining Co Ltd., Holcim South Africa (Pty) Limited, Hollard Insurance Company Limited, Howden Africa Holdings Limited, Illovo Sugar Limited, Industrial , Development Corporation of South Africa Ltd (IDC), Infrastructure Finance Corporation Limited (INCA), Investec Group Limited, Johnson & Johnson (Pty) Ltd, Kirchmann-Hurry Investments Limited, Kumba Resources Limited, Liberty Life Association of Africa Limited, Lonmin Platinum, Macsteel Service Centres S A (Pty) Ltd, Maluleke Seriti Makume Matlala Inc, MBB Services International, Medical Research Council, Mercantile, Mercedes-Benz South Africa, Mkondeni Motor Garage CC, Momentum Life, Msunduzi Municipality, Nampak Limited, National Brands Limited, Nedcor Limited, Old Mutual, Outsurance, Pretoria Portland Cement Company Limited, PriceWaterhouseCoopers Inc, Rand Merchant Bank, Read, Rennies Travel, RMB Properties, SA National Parks, SA Tourism, Sanlam Asset Management, Sanlam Limited, Santam Limited Sappi Limited, Shell South Africa (Pty) Ltd, Shisaka, Siemens Telecom Ltd, Southern Sun Holdings Limited, Spoor & Fisher, Standard Bank of South Africa Limited, Sunspray Food Ingredients (Pty) Limited, Technoserve, Tente Castors SA (Pty) Ltd, TEP , The Old Shanghai Firecracker Factory, The South African Breweries Company, The Tongaat Hulett Group Transnet Limited, Unilever SA (Pty) Ltd, Volkswagen of SA (Pty) Limited, Wesbank, Western Areas Limited, Wilson Bayly Holmes-Ovcon (Pty) Ltd.
Lucas Radebe, Graham Smith, Baby Jake Matlala, Francios Pienaar, Bruce Fordyce, Willie Mtolo, Deshun Deysel, Sarah Mahlangu, Thomas "The Hit Man" Mashabe, James Perry, Kabelo, Donavan Cech and Ramon De Clemente. Through media partnerships with SABC and etv, the Business Trust was able to generate millions of Rands worth of television, print, radio and online coverage.